Home › News › Cedars Annual Auction and Raffle Soirée 2018 at Le Windsor a hit! Cedars Annual Auction and Raffle Soirée 2018 at Le Windsor a hit! Cedars Annual Auction and Raffle Soirée at Le Windsor a hit! Montreal, November 28, 2018— Last night, over 500 people gathered at Montreal’s iconic Le Windsor for a festive evening to help the Cedars Cancer Foundation go beyond in its efforts to help cancer patients and their families. With over 1,600 raffle tickets sold for the coveted cash prizes and a prestigious Rolex watch, as well as bids made online and onsite for the silent auction items, plus bids the exciting live auction, more than $370,000 were raised. Cedars is very grateful to the hundreds of people who made this annual event another resounding success. 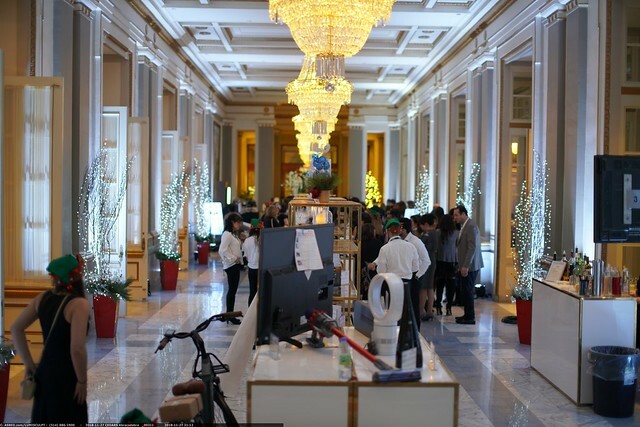 Amidst a sparkling décor at Le Windsor, patrons sampled food from some of Montreal’s trendy eateries, La Sirène de la Mer, Rib N Reef, Buffet Il Gabbiano, Ryú, Lesters Deli, Lagoon Sea Food, Felice, Mtl Avec Amour et Lafrenaie, while sipping their beverage of choice; bid on everything from the quintessential holiday basket to large-ticket items. All cheered as the much-anticipated raffle prizes were drawn one after the other. In addition to Ladies Rolex Oyster Perpetual Lady-Datejust 28 in 18kt Yellow Gold', worth over $35,815 (incl. tax) courtesy of Château D’Ivoire and Rolex Canada, 16 cash prizes were drawn, ranging from $1,000 to $20,000, for a total of $50,000. This year, all proceeds from the event will support the Psychosocial Oncology Program at the MUHC. This program offers cancer patients and their families free access to a team of psychologists and therapists to help them manage the social, psychological, emotional, spiritual and functional aspects of cancer. The Cedars Annual Auction and Raffle Soirée would not have been an unbeatable crowd-pleaser without the tremendous contributions of donors, sponsors, our event chairs and organizing committee. On behalf of the patients and families who are our raison d’être, Cedars extends a heartfelt thank you for helping us to go beyond!